Acoustic Ales Brewing Experiment is located in a facility built in 1912 to support San Diego’s then vibrant beer scene. Unfortunately, Prohibition put a damper on those ambitions in 1919, forestalling the development of the brewing industry for decades. 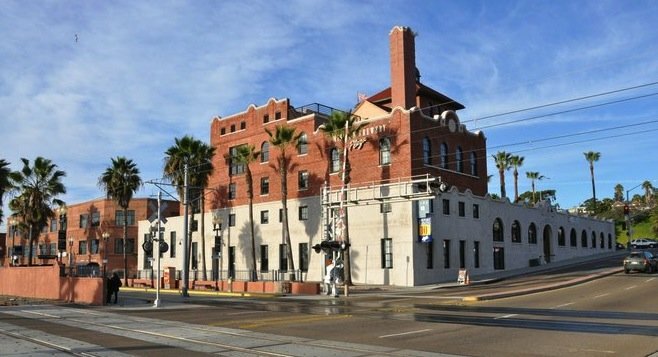 A century after the facility was built, Acoustic Ales picked up the baton and in 2012 started brewing in Mission Brewery Plaza, serving bars, restaurants and bottle shops in the San Diego area and beyond. The three ales featured in this post are intended as a beer bridge between winter and spring. 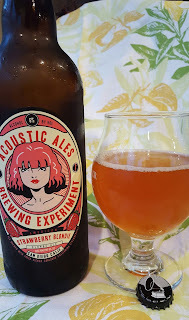 Witte Snake, a Belgian-style witbier (or white beer) and Strawberry Blondie, an American blonde ale with fresh strawberries, are harbingers of the longer, warmer days ahead. Meanwhile, Unsung, an imperial chocolate and oatmeal stout aged in bourbon barrels, reminds us that the chilly wet weather is still with us. Witte Snake is a faithful rendition of the Belgian witbier style. Although Witte Snake is under 5% in alcohol by volume, there’s still a lot going on in this surprisingly complex beer. Along with wheat (typically around 50%), barley and sometimes oatmeal in the malt bill, wit beers are usually flavored with floral coriander and lemon peel and bitter Curacao orange peel. 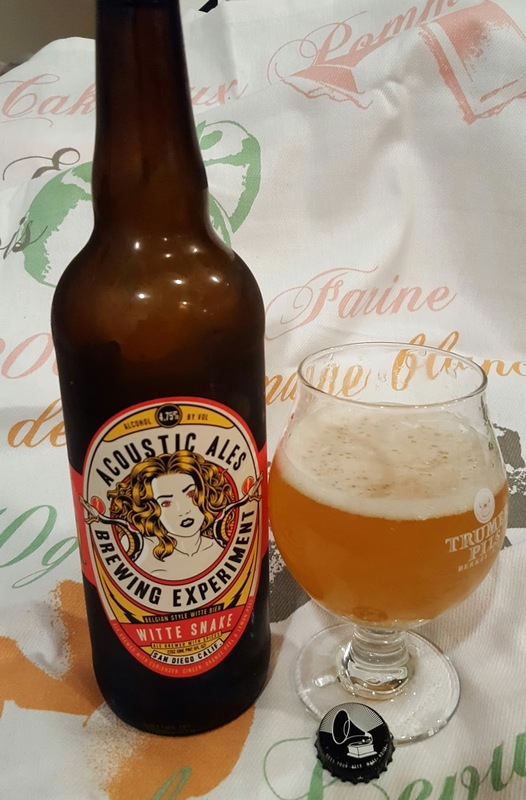 Acoustic Ales’ Witte Snake also has a hint of ginger. As with all Belgian beer, yeast is a prominent flavor component. Witte Snake is bottle conditioned, so you’ll probably notice a little sediment in the bottom of the last glass. Witte Snake pours a hazy gold. A creamy head swirls on the top. Fragrance is coriander phenols with citrusy orange and lemon esters and a hint of ginger. Flavors are slightly sweet and tart, and spicy with hints of zesty orange Curacao and lemon peel. The ale yeast helps promote the citrus notes and the finish is dry. Enjoy this refreshing ale on the patio in the sunshine. Mussels and French fries are a classic pairing or try it with cheeses or panna cotta. 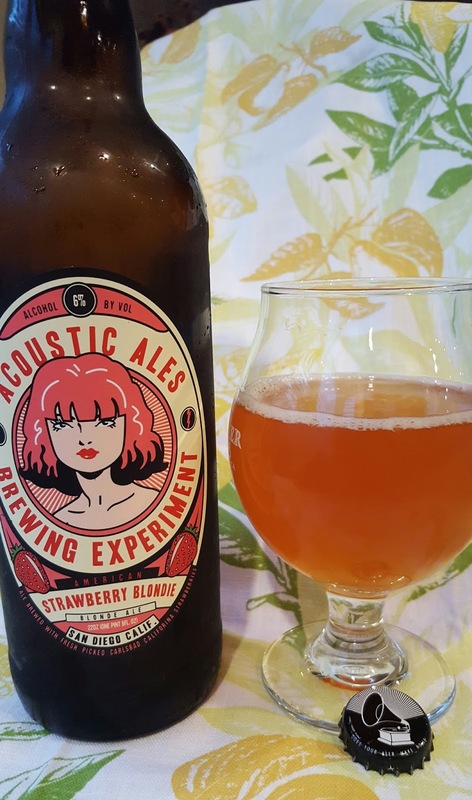 250 pounds of fresh local strawberries are the star in this excellent beer. The supporting role belongs to the suitably subtle structure of the nicely crafted American blonde ale. Just bottled in mid-February, Strawberry Blondie packs the semi-tart sweetness of newly picked strawberries. Strawberry Blondie pours a light amber tinged with strawberry pink. A sparse head lingers for a short while. Initial fragrance of strawberries is light, but grows stronger as the beer warms. Flavor is strawberries, strawberries, strawberries. The fruit shines here, and if you like strawberries you’ll love this beer. Finish is semi dry and short. Strawberry Blondie might be one of the easiest drinking beers I’ve had. Yet at 6% abv, this Blondie is no lightweight. This might be a beer to share with your non beer-drinking friends. Quaff Strawberry Blondie at your earliest convenience to fully appreciate the fresh strawberries. 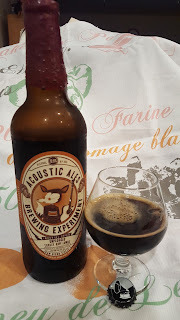 This version of Acoustic Ales’ Unplugged series is an imperial coffee chocolate oatmeal stout aged in Wild Turkey bourbon barrel. 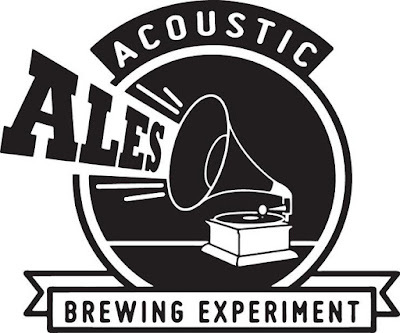 “We took our base Unplugged Imperial Chocolate Oatmeal Stout, which has oats, 80 pounds of Belgian Callabout milk chocolate per 15 barrel batch, brown sugar and wild flower honey, rested it in bourbon barrels from 8-12 months and added Kopi Luwak coffee” says Acoustic Ales owner and brewmaster Tommaso Maggiori. The beer pours a dark brown with a persistent tan head that laces the glass. Carbonation is smooth. Initial aroma is bourbon barrel. The flavor is boozy bourbon barrel sweet followed by semi-sweet chocolate and a dark roasted coffee bite. The finish lingers on the palate. Let the beer open up in the glass to fully experience all of the flavors. At a noticeable 12.5% alcohol, Unplugged is a big beer, best enjoyed with friends on a dark and stormy night or after dinner with rich chocolate cake.